A lively history—with fictional elements mixed in—of fledgling America’s first clash with the Islamic world. “So sit back dear reader and relax,” writes Hook (Never Subdued, 2011) at the beginning of his new book. “Read on and enjoy a true history with real heroes, real villains, and real outcomes.” The story he proceeds to tell is one that will be unfamiliar even to most of his American readers because this chapter in American history tends to be truncated or skipped entirely in most grade school and high school textbooks. It’s the short but complicated story of the diplomatic and military confrontations between the young United States under the leadership of President Thomas Jefferson and President James Madison and the Islamic and Ottoman states of Tripoli, Tunis, Algiers, etc.—the so-called “Barbary” states that outraged the U.S. by seizing the nation’s ships and enslaving sailors. In chapter after exciting chapter (all of which, in this current edition, is bizarrely presented in boldface), Hook presents a well-researched and well-documented narrative history of the diplomatic and naval collisions between the various Muslim beys and emirs and the various U.S. sailing masters, the captains and commodores who sailed the original small fleet of American frigates to the other end of the world (also expanding his story to include a very spirited account of the War of 1812). He dramatizes the stories of memorable figures like Lt. Stephen Decatur, Commodore Edward Preble, Lt. Isaac Hull, or the more checkered career of Commodore Richard Morris. This is vital, readable history written smoothly and professionally (although the text is in need of a front-to-back edit to fix annoying little details like the fact that Dolley Madison’s first name is misspelled throughout the text), and Hook unites most of his matter with a warning about the present now that the West, once again, faces conflict with the Islamic states. 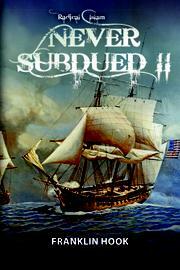 A vividly drawn history of the clash between the United States and the Barbary states.